TBA. Replaces ToC chapter in original document. Non-material changes in formating when switching to Asciidoctor. An approved provider of a PKI based trust services for certification and dissemination of public keys . Enhanced PEPPOL eDelivery Network - Financial grade PEPPOL. This is recommended by Bits but may be flouted following a risk assessment and consideration of mitigation. The purpose of this document is to create minimum security requirements for data transport in the financial industry. This document contains requirements for secure file-based transport of financial messages. These requirements are limited to security requirements. Requirements concerning other technical aspects are covered elsewhere. All references to PEPPOL in this document refers to the Enhanced PEPPOL eDelivery Network. The Norwegian banks are in the process of implementing ISO 20022-based messages for handling of payments, such as payment instructions from customers or notifications sent to customers. This development implies an introduction of ISO 20022-based messages in the bank-customer interface and a gradual phase-out of the currently established formats. As part of this implementation there have also been a growing recognition for improvements to the communication infrastructures used. It is recognized that any future communication infrastructure used in the bank-customer interface need to build upon infrastructures and standards commonly accepted in the market and provide the technical and legal security required for this type of business transactions. The PEPPOL eDelivery network is widely used for exchange of invoices and credit notes in EHF and PEPPOL BIS formats in the Norwegian market. It is also used for exchange of product catalogues and orders in the same formats. A clear majority of the public sector, most banks and more than 65.000 private sector entities can receive documents through the network, and in 2016 more than 35 million invoices was exchanged. More than 50 service providers offer connectivity to the PEPPOL eDelivery network through access points, and more than 60 service providers offer solutions to issue or receive EHF or PEPPOL BIS business documents. From 2017, an enhanced version of the PEPPOL eDelivery network will be used for submission of tenders in public procurement. Both banks and ERP vendors, as well as their customers, have a need for one common solution for transport of ISO 20022-based messages. By using a common eDelivery solution for handling ISO 20022-based messages banks, ERP vendors and their customers need only to connect to the infrastructure once to serve the entire market. This document sets out the Bits’ security requirements all parties using any transport infrastructure will have to adhere to, in order to be allowed access to the network for transfer of payment information. Initially the infrastructure used is Enhanced PEPPOL. Therefore, Enhanced PEPPOL is referred to throughout. This document will have to be revised annually or if there are major changes, such as the document being applied to a different transport infrastructure. For easy adaption, software may be downloaded from https://www.github.com/difi. Github contains a library for formatting data and crypto based security functions, as well as access point software. Other – Any use of this code requires reporting to the authority responsible for the transport infrastructure. The transport infrastructure shall support confidentiality, authenticity, integrity from corner 1 to corner 4. All receipts must contain SBDH information in order to refer to the correct ASiC container. The software used in the common infrastructure implementations must be subjected to external code revision and penetration testing annually and in cases of major changes. All servers must have Network Time Protocol (NTP) services activated and configured for regular updating from a verified and redundant source. All private keys must be stored securely. The Public keys must be certified by a trust anchor in an x509 certificate. If experiencing a delay in receiving receipt, C1 must initiate an investigation. Any party initiating an investigation is responsible for sending an investigation in progress message in place of receipt immediately. When investigation is completed, Resolution of investigation message must be sent. C1 is ultimately responsible for following up investigations. Encryption process must adhere to the description in Annex 1 of this document. C1 must have a key pair for signing where the Public key is certified by a trust anchor in an x509 certificate. C1 must have obtained a public key for C4 from BCP. This key shall be used for key encipherment of a session key that shall encrypt the outer ASIC. 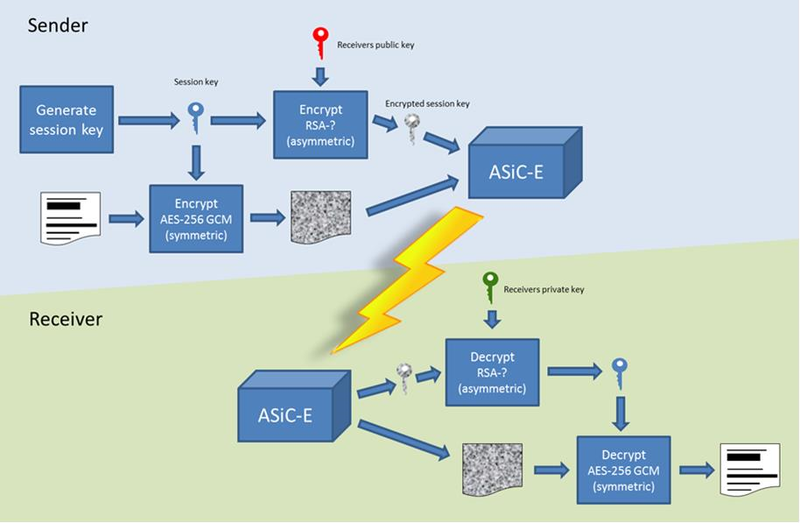 C1 must sign inner and outer ASIC container using the same (sign 1) Private Key based on business certificate issued by a qualified trust anchor. All operations involving use of the key store shall be logged in an audit trail that can be retrieved by an operator with sufficient access rights. If sender uses a second signature in addition to the sign 1 on the inner ASIC, signatures are considered to be parallel i.e. signing the same content – not signing each other. C1 must build an SBDH according to specifications from DIFI. When a file is completed, it shall immediately be submitted for generation of inner ASiC, without intermediate storage or possibility for change. C1 is responsible for validation of content before signing. End systems (Corner 1 and 4) must use a certificate authority on Bits’ list as trust anchor for the signatures and key encipherment that are mandatory in this specification. Trust anchor must revoke certificates immediately upon notification of compromise of Sign1 key by using industry standard mechanism (CRL and/or OCSP). BCP is a shared certificate server for storage of public certificates. It will store public certificates from participants who may assume the role of C4, and as such receive encrypted files, and make the relevant public certificates available to C1 participants as required. Certificates will then have to be validated with trust anchor service provider. BCP shall store public certificates from C1 and C4, and make them available to C1 and C4 upon request. All access to BCP must be logged and logs stored for a minimum period of 3 months. Changes / update of certificates must be done by trust anchors. C4 must have a key pair with key usage for key encipherment. It is used for negotiation of symmetric keys for encryption of content. It is industry best practice, and the most secure approach, to maintain private keys in a physical Hardware Security Module (HSM). The private key should be created and stored only inside the HSM. This prevents, with the strictest means, the private key so that it is not compromised or copied by an attacker. This also requires the application to address the private key with an interface, e.g. PKCS#11, since it does not have direct access to the private key to perform cryptographic operations. For development and test environments, and environments where a physical HSM is not feasible, a virtual HSM should be considered. Using HSM would in a large amount have mitigated the Heartbleed attack, since the attacker could not extract the private key from memory, because the private key is NOT residing in memory of the server.